It was almost a total collapse – again. Two days after letting a two-goal lead against the Tampa Bay Lightning slip through their fingers, the Red Wings lost a three-goal lead against the Maple Leafs Thursday night in Toronto. Another game needing extra time to decide a winner, but this time it went better for Hockeytown. 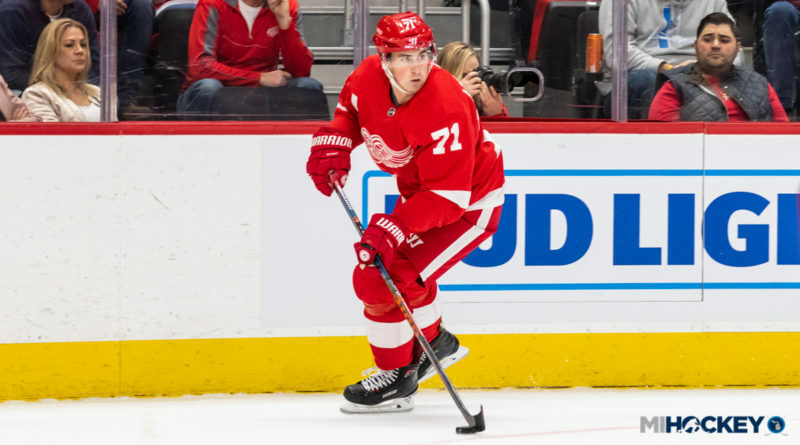 Dylan Larkin scored the game-winning goal in overtime for the Wings, giving them a 5-4 victory over their Original Six rivals. After an early goal by Toronto’s Kasperi Kapanen, the Wings rattled off four goals through the first 40 minutes of play to take a 4-1 lead into the third period. That’s where the high-powered Toronto offense went to work, as John Tavares scored 2:38 in. Then former Wolverines star Zach Hyman made it 4-3, and Andreas Johnsson tied it at the 11:36 mark of the third. Larkin’s 11th of the season gave the Wings the deciding goal, saving them from the same fate they suffered at home against Tampa Bay on Tuesday. Jonathan Bernier made 27 saves to record his third win as a Red Wing. Detroit is now 13-12-4 on the season. The Wings’ 30 points through 29 games put them two back from Boston, which holds the second wild-card spot for the playoffs. Overall, they are No. 8 in the Eastern Conference and No. 18 in the NHL.